Hi everyone! I’m Heather, Kelsey’s BFF from middle school (yeah, we’re getting old), filling in while Kelsey sleeps for a few days in wedded bliss. While Kelsey is bringing the fabulous to DC, I live in Memphis. And while DC is nice and snowy this time of year, it’s been in the 60s half of January here. And then it drops 30 degrees. In these uncertain times, my go-to outfit is riding boots and a long-sleeved dress. Here are some of my current faves. My go-to boot style - they literally go with EVERYTHING. I love a great print - why wear solids when you can have so much more fun? Obsessed. The fit is spectacular and that print is to die for. I could (and do) wear florals year-round - it’s never too cold for flowers! Again with the florals - and this one has the added bonus of being green and white for this KD. This look is great for a business-casual office like mine, and then for going straight to happy hour. And keeps you warm but not overly toasty on those crazy weather days! 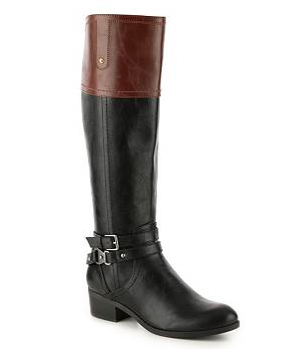 i LIVE in my two two-toned riding boots! great pick!